We at Winland's Complete Landscaping Service are a family-owned company that provides superior landscaping services to clients in and around Zanesville, Newark, and Blue Rock. Our company also proudly services Trinway, Columbus, East Fultonham and the surrounding areas. Designing a landscape takes a considerable amount of experience, skill, knowledge as well as creativity. We have all of these attributes and have handled a large number of landscape design projects for clients across the region. Our team of landscape designers has the ability to take your ideas and preferences, incorporate their inputs and suggestions in order to make sure that you get beautiful outdoor spaces that will meet your lifestyle requirements and increase the value of your home. Once you have a well - designed landscape, it is also pretty important to ensure that it is maintained with regularity. That is the only way all of the softscaping and hardscaping elements will stay in good condition and retain their appeal. Well-maintained landscapes are a pleasure to look at, more usable and practical and increase the curb appeal and value of the property. A patio is one of the most widely-installed outdoor living features on residential properties. Certain businesses like restaurants and hotels may also have patios on their premises. If you want a resilient, durable and easy to maintain patio, it is a good idea to consider getting it paved with interlocking pavers. Every lawn needs the right amount of nutrition at the right times in order to keep it healthy and green. This is where our lawn fertilization services come into the picture. We create customized plans that will meet the fertilization needs of your residential or commercial property. We understand that there will be different types of top soils and grass. Installing different types of water features in the landscape is one of the best ways to add balance to the outdoor areas of your home or commercial establishment. As a full-service landscaping company, we recommend the inclusion of features such as waterfalls, fountains, ponds, streams etc. If soil erosion is a problem on your commercial or residential property, it is very important that you get specialized soil erosion prevention installations for your landscape. Our expert landscapers will survey the available space in order to determine which installations would work well in your setting. Soil erosion can prove to be very detrimental to the integrity and overall stability of your landscaping. 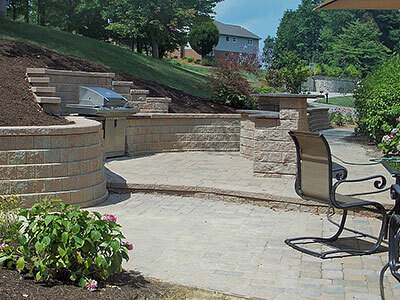 Our company provides excellent residential landscaping solutions. As part of these services we handle everything from conceptualization, planning and design, installation and maintenance. This means, regardless of whether you need a small yard designed and installed or a larger landscape planned, we are the professionals that can handle the job in an expert manner. A commercial landscape is very different from a residential one. Its condition and appearance can have a major impact on the impression that customers and clients as well as employees have about the business, which can affect your reputation in the market. We make sure that the design and installation of commercial outdoor spaces is planned to perfection and that every feature is installed with care. Retaining walls are built at different points in the landscape where soil erosion is a problem. These specially-engineered walls could also be built in areas that have sloping land which needs to be excavated. The structures provide the backfill and the exposed slope a good amount of support, which increases the stability of the landscape. Our expertise in this space allows us to provide custom landscape design and related services at very reasonable pricing. For any more information about our solutions or want to request a quote, feel free to call Winland's Complete Landscaping Service at 740-453-6270. We assure you of nothing but the best services at all times. You can also use this Contact Us form to send us your project details or queries.